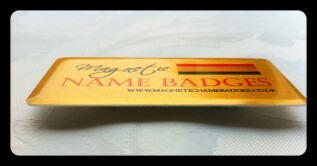 Find our more about our 72 x 36 mm brushed gold name badge from our popular range of metal name badges. Whilst it’s fair to say that our brushed gold badges aren’t quite as popular as our brushed silver name badges, they look equally as stunning especially when printed in full colour. The metallic gold finish adds that touch of class and elegance, whilst the brushed effect tones it down enough ensuring it’s not too flashy, or in your face. If it’s class, elegance and professionalism you’re looking to portray with your name badges, our brushed gold name badges have to be a serious contender. 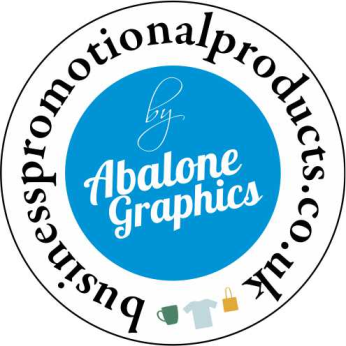 With an overall badge size of 72 x 36mm the badge also features a subtle bevel set 2mm from the inside edge, giving the name badge an effective print area of 68 x 32mm. 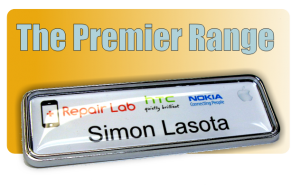 Made from durable, lightweight yet strong aluminum and with a badge thickness of less than 1mm (excluding magnetic name badge fixing) our metal name badges are the lightest name badges we currently produce, with the 72 x 36 metal name badge weighing in at just 16 grams. 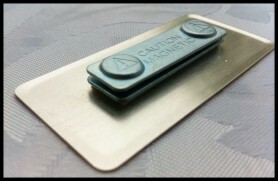 The 72 x 36mm metal name badge corners are rounded to offer a professional appearance, and also to ensure the badge features no sharp points. 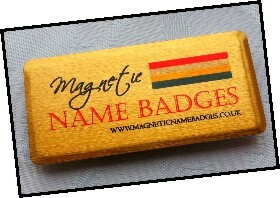 Like all our magnetic name badges our brushed gold name badges can be produced in full vivid colour. 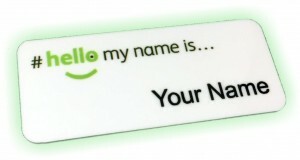 Unlike inferior name badges that are surface printed or simply feature a sticker, at magnetic name badges we permanently dye your badge design right into the face of our metal badges for maximum durability. This process ensures that your badge designs are permanent and can’t be pecked or scratched off, in fact you can’t even feel the dyed part of the badge. 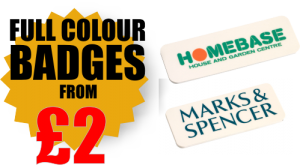 We can’t print white onto any of our badges, so if your badges feature white as part of your design this will not be printed, any white in your name badge design will actually be the background colour of your choosen badge. On our Gold metal name badges, colours darker than the actual gold badge colour work best this can be likened or actually reproduced by printing out your design onto gold coloured paper, the outcome of this is essentially the same as what will be reproduced by us on your gold metal name badges. 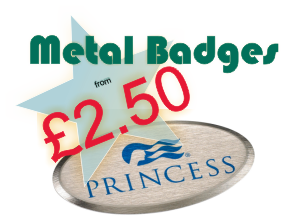 The gold background colour of the badge can affect the overall colour of your design, exactly the same as if you printed your chosen name badge design onto gold coloured paper.